This was our dinner last night, me and the 4 men I live with. And they about three of them helped.. so our little kitchen was cramped. 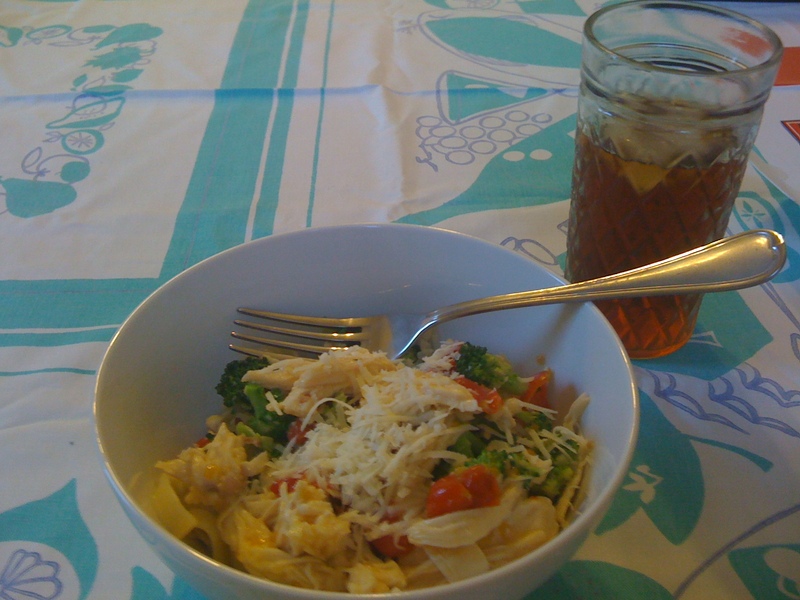 This recipes is for Chicken, Broccoli, and Cherry Tomatoes Fusilli. Except, we didn’t have any fusilli so we used fettucini. Here’s the recipe. The tea is Pomegranate sun tea. The cherry tomatoes come from the volunteer plant we have growing over a lot of the porch and under the screen door. And the tablecloth is from The Antique Shoppe in Fairbury, IL but that’s another post.